In March 2019, TBR partnered with Non-governmental Organization, Goducate, by organizing two workshops in the Philippines to reach out to youth in Iloilo and engage local law enforcement officers in Laguna. The interactive workshops covered topics on peace-building, diversity, inclusion and sustainable development. 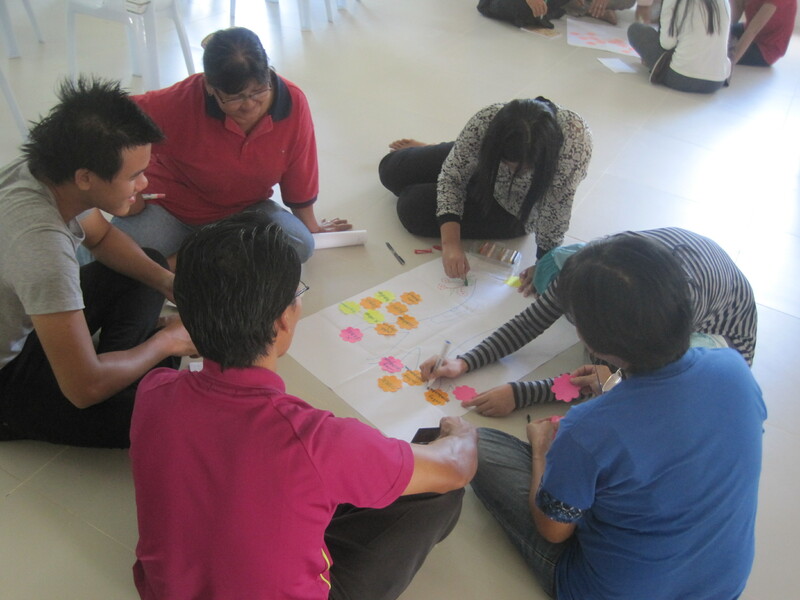 The Peace, Diversity and Inclusion Workshop was successfully held for the second time in Iloilo, Philippines in March 2019. Co-organized by The Blue Ribbon Global and Goducate, the workshop aimed to provide education and leadership training to youth. A locally based organization, Goducate, seeks to provide such opportunities to various youth groups. By facilitating the workshop, The Blue Ribbon Global hopes to partner Goducate to achieve its goal of equipping youth with necessary skills to thrive professionally. As such, The Blue Ribbon Global sent a small team to help engage with the participants and arrange activities. The two-day workshop centered around 12 lessons aimed at teaching self-discovery and forgiveness through interactive means. Using Google Classroom and Kahoot applications (apps), we created various quizzes and games to help our team members and the participants to engage with one another. The use of these apps also highlighted to participants the benefits of interactive technology in engaging with others and organizing programs. Participants gave positive feedback on this teaching method, as forming groups helped tighten the bonds among them, promoting teamwork and social engagement to better achieve their goals. A global aspect was introduced to the workshop through a Skype interview with the Afghan Youth Empowerment and Peace-Building team, led by its director, Ahmad Shah Karimi. The discussion surrounded the benefits and challenges brought about by the Internet and artificial intelligence (AI). One of the conclusions the group arrived at was that the Internet is ultimately a communication tool that can “set the course of the country’s future”. According to one of the team members, this was specifically so in the context of Afghanistan. The Skype interview was included to introduce global communication and topical discussion to the participants. By conversing and challenging the ideas presented, they can increase their knowledge with new perspectives. Furthermore, Joanna de Leon, a student of the University of the Philippines, who did her intern with TBR Malaysia and UCSI University last September 2018 also organized a meeting with the Director of Student Affairs of University of the Philippines Visayas, Assistant Professor Augustin G.Huyong. TBR founder, Norani Abu Bakar met Professor Huyong to discuss on the upcoming regional gathering, TBR’s Young Peacemakers UnConference, that will be taking place during International Day of Peace September 2019 at UCSI Malaysia. The response was very positive and UP Visayas was also keen to conduct PDIE workshop at UP Visayas in October 2019. 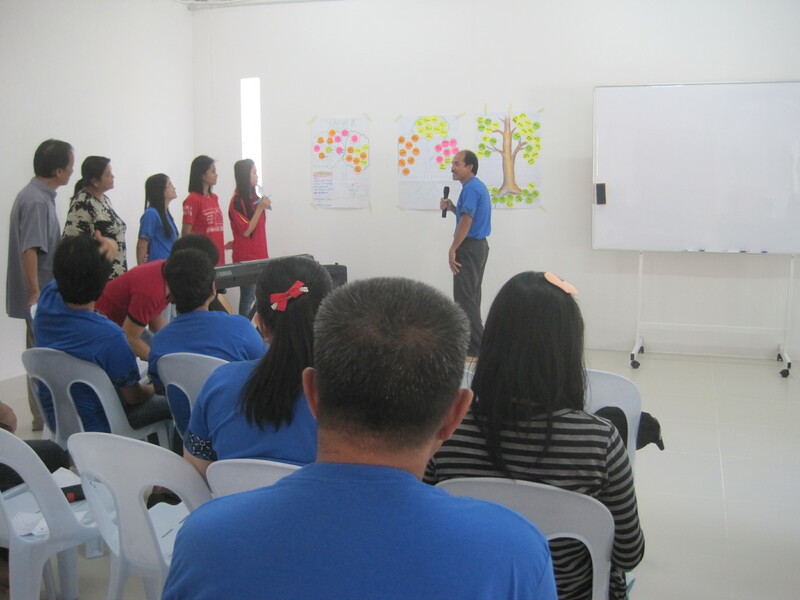 In addition, The Blue Ribbon Global conducted a four-hour workshop at the Goducate Center in Laguna. Participants included the Goducate team and local law enforcement officers including the SWAT and police officers. The aim of the workshop was to introduce to them topics such as Sustainable Development Goals, as well as the Peace, Diversity and Inclusion. This was an opportunity to engage with Laguna at a local level through conversation and learning alongside law enforcement officers from the area. TC Laguna Director, Mr. Leo Decinal, who is also the Head of Police Community Relations for Calabarzon, is now planning to organize the two day of PDIE workshop for law enforces of the five provinces that he is responsible for. Both workshops were a success and we were happy that the participants gave us positive feedback. The Blue Ribbon Global believes in our partnership with Goducate, as their goal to teach and equip youth with the skills to form strong leadership is key to developing the minds of tomorrow’s leaders. 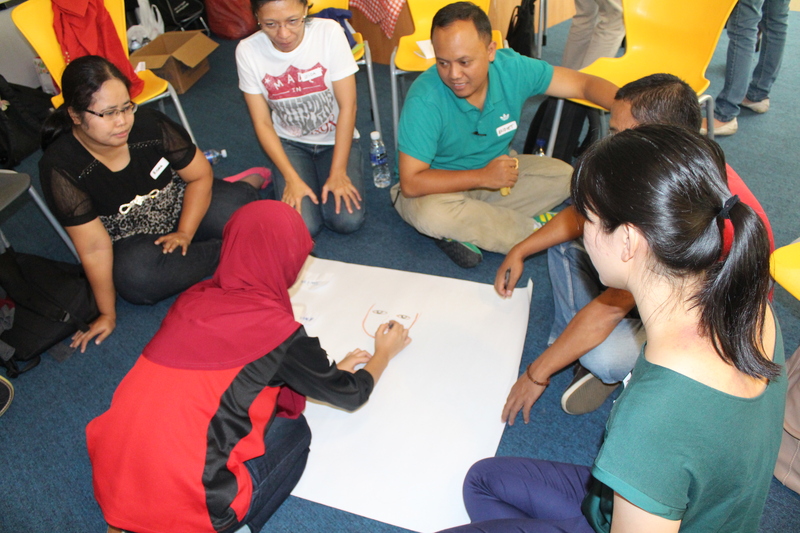 150 young adults and their mentors came together for the Young Peacemakers UnConference (YPuC) on 4 February 2018 at the Department of Southeast Asian Studies (DSAS), Faculty of Arts and Social Sciences, University of Malaya (UM). The full-day event was a program by The Blue Ribbon (TBR) Global, and was co-organized by UM’s Faculty of Arts and Social Sciences (FASS), and Pathways for Mutual Respect (PFMR) USA. The discussion on launching YPuC and Pathways Institute at UM started in mid September 2017. It was then followed up by a seminar on “Religion, Culture and Society” initiated by Professor Dr Thirunaukarasu Subramaniam of Department of Southeast Asian Studies, UM on 19th October 2017. YPuC was also run with the support from Peace Generation (PG) Malaysia and El-Shaddai Centre Berhad, and other partners: Young Interfaith Peacemakers Community (YIPC) Indonesia, UCSI University Malaysia, Bintan Bersatu Apparel Batam, and Afghan Peace Volunteers (APVs) Afghanistan. Held in conjunction with World Interfaith Harmony Week (WIHW), the YPuC was a platform for participants from different cultures and religions to explore how peace can be initiated through mutual respect, understanding, and long-term positive relationships. Half of the YPuC participants came from Malaysia and the rests were from other Southeast Asian countries, Africa, South Asia, Middle East, China and the USA. YPuC was premised on the fact that contributing together as a community towards sustainable community development and common goals is the way to ensure borderless peace-making remains an ongoing priority in this diverse world. 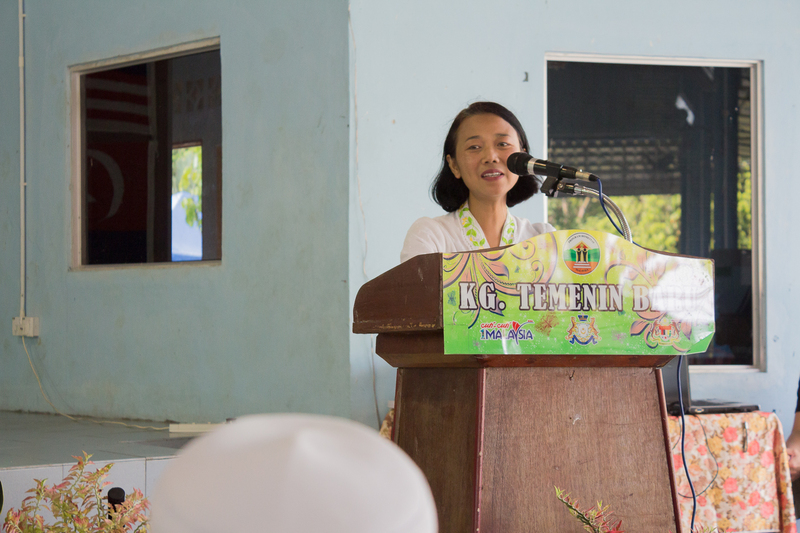 “We want to hear the voices of young people in peace building,” said Ms Norani Abu Bakar, Founder of The Blue Ribbon (TBR) Global and Asia Director for PFMR, urging them to come up with solutions for barriers to understanding and inclusion. TBR’s tagline “if two people listening and talking with each other is the basis for change and peace, imagine what a few hundreds of young people can do?” was an open invitation to all youth to join this borderless peacemakers’ community. YPuC presenters from Malaysia were PG Malaysia, Projek57, and El-Shaddai Learning Center; from Indonesia were YIPC and TBR Batam; and from Singapore were TBR Singapore, Creation Care SG and FiTree. 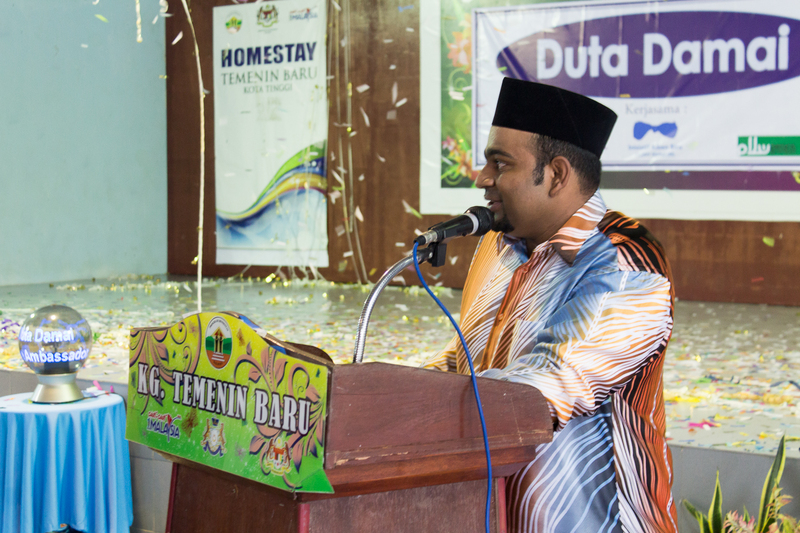 Other guest speakers were from UNHCR Malaysia and the Harmony Center, Islamic Religious Council of Singapore. The highlight of the program was the engaging three hour of small group discussions and participant-driven learning sessions to bring out the theme: Connect, Converse, Contribute for the Common Good. The persistent effort of ElShaddai Center Berhad (ECB) to educate young refugees in Klang has catalyst The Blue Ribbon to develop Introduction to Peace and Diversity as a subject for ElShaddai’s upper high school students. The subject was launched when its school resumed in January 2018. The journey began with a peace and diversity weekend camp for ElShaddai E-Learning students in June 2017. 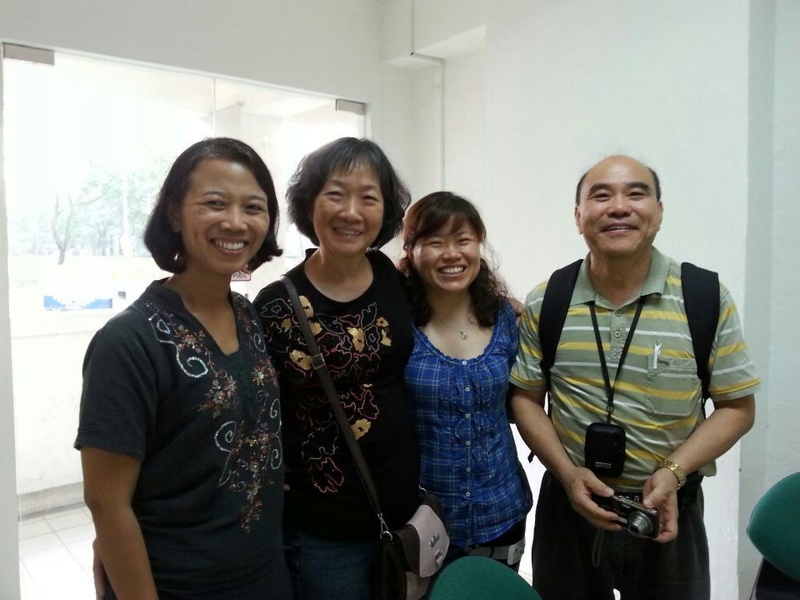 Following this first encounter, its founder, Andrew Ng and Academic Director, Dr Ng Oi, decided to open invite ElShaddai’s high school teachers to TBR’s peace and diversity camp. The positive response from the teachers led TBR and ECB to run a few more peace workshops including Training of Trainers. Today, ElShaddai’s teachers are collaborating with The Blue Ribbon in translating peace and diversity camp booklet into various languages. Facilitators from Pakistan, Afghanistan and Sudan refugee communities are now diligently translating the booklet into Urdu, Dari and Arabic language. Besides these refugees communities, TBR’s chapter in Batam has also came out with a task force to raise young peacemakers from high schools and undergraduate programs of the high learning institutions on this island. TBR is now discussing with Batam core team and its key partner, Bodynits’ Bintan Bersatu Apparel in translating the student handbook of Introduction to Peace and Diversity subject into Indonesian language. With the energy and collaborative effort of the young peacemakers in the region, The Blue Ribbon and its partners are hopeful that love, peace and human justice will be a way of life for the coming generation! At the beginning of May, The Blue Ribbon (TBR) had the privilege of engaging a group of student leaders from the National University of Singapore’s College of Alice and Peter Tan (CAPT) in a 3-day leadership retreat at Kulim Eco-Trail Retreat (KETR). TBR was tasked to be the catalyst to enable the students to cogitate and ruminate over the challenges that face leaders – in essence, to arm them with a diagnostic framework that will enable them to identify specific leadership challenges and the potential remedies. The leaders were CAPT’s Resident Assistants (RA), Neighborhood Heads (NH) to College Student Committees (CSC). Suffice to say their challenges were myriad and as facilitators TBR coaxed out of them their grievances and frustrations for them to thrash them out and come up with viable and contextual solutions. It was especially gratifying and also constructive as many of the leaders got to interact with each other for the first time despite being from the same college. KETR, located in an old palm oil plantation and housed the manager’s estate on the banks of the Johore river, was ideal to put things into a practical perspective with outdoor activities such as raft building to get the students to appreciate the virtues of teamwork. The three days culminated in a pleasant two-hour hike up Banana Hill with stunning views of the surrounding area. The packed three days we hope will serve to put into a motion a mindset that will enable the students to appreciate the complexities of leading, but also the utmost importance of humility and value in serving as leaders; to lead so as to serve something greater than themselves and not to be daunted by the inherent challenges. How can your tourist dollar help contribute in a small way to the environment and foment a cross cultural footprint? We make no bones of wanting to get the most out of you, but not before you will have had the rare gratification of having been part of something greater than yourselves, and what is more, on a holiday. Immerse yourselves in the rich Malay heritage of Kota Tinggi, the birth place of the Johor Sultanate, which has echoed down through the lineage of, not just Johore’s, but the Malaysian Royal heritage. You will have the occasion to use the smatterings of Malay you may have in your linguistic arsenal, or indeed put into practice what you may have been formally learning. From a firefly cruise to royal tombs, waterfalls to poultry farming at Garden Spring, Kota Tinggi is an anthology of history and ecology that can be experienced dazzlingly yet pleasurably all in one day. 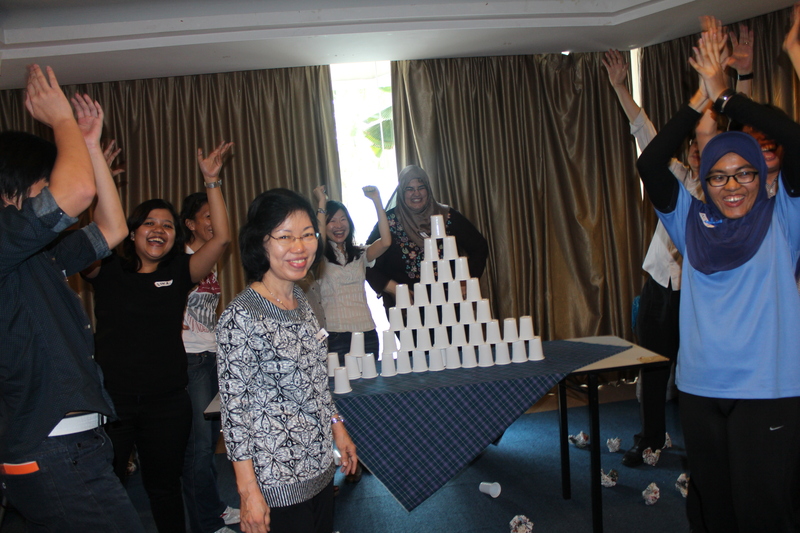 We also offer a team building package for youths and corporates alike. One has options to either camp at Garden Spring or hideaway at the Kulim Eco resort perched prettily on the banks of the Johore river. or indulge in the domestic bliss of Home of Peace. Finally, how DOES your leisure contribute to the greater good, you may undoubtedly be enquiring? Well, all revenue is ploughed back into Garden Spring, which we hope will serve as a catalyst to communal improvement visually and by creating prospects for employment in the community. With your DOLLAR, we seek to MAXIMISE SOCIAL and SPIRITUAL RETURNS. One man’s junk is another man’s treasure is an adage we take on board wholeheartedly at The Blue Ribbon (TBR). A simple idea with a disproportionate impact. 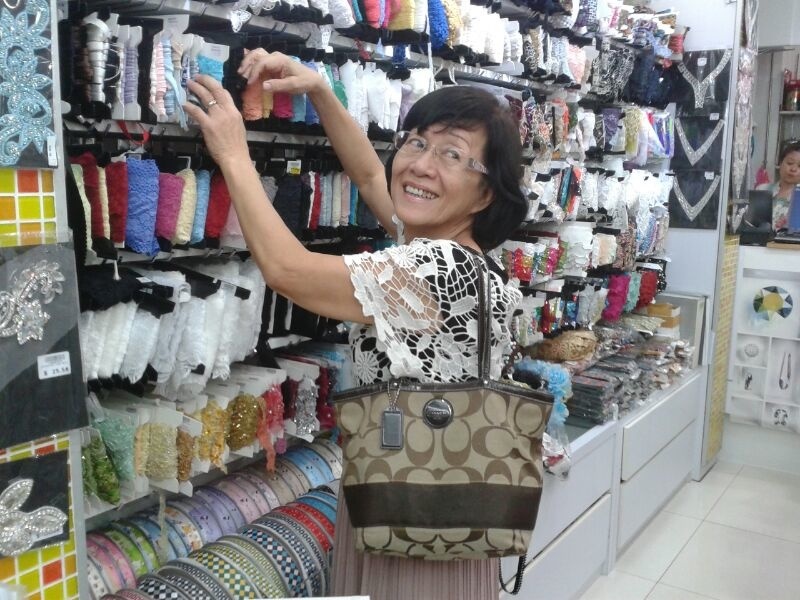 TBR in collaboration with BE Incorporated Singapore offer the dignity of work to Singaporean ladies with needs who put their seamstress skills to good use. Where recycling is noble, they take it a step further in shredding surplus t-shirts for material to make stuffed toys. The unwanted is therefore ‘upcycled’ into instruments of smiles for children. TBR’s next delivery of these stuffed bears will be in April of 2017 to underprivileged students in Guizhou, China. The model is not ‘rocket science’ so that it is easily scalable and most importantly sustainable. TBR’s team of mothers from low-income families have a proven record of accomplishment with delivery of T-shirts that have been transformed into Bermuda shorts to stateless children in Sabah and children from poor families in Batam, Indonesia. The latter having been a project with Torch Light foundation, Indonesia. The premise for this sewing project has been sponsored by Lakeside Family Services ever since DL-2GO’s inception in Singapore in July 2014. Mothers need not fret about not having any prior experience in threading needles. All sewing skills can be acquired and taught on the job by other mothers who gratefully pass on the skills they had acquired from past projects. The impetus a mother has to look after her family has an implicit reliability. A society’s success or failure depends strongly on the health of the household and we believe that mothers are the backbone of that structure. We hope to be merely agents in channeling this in a manner that benefits society at large. The Blue Ribbon (TBR) farm project called ‘Garden Spring’, located at Kampung Batu Ampat on the way to the well-known Kota Tinggi waterfall, officially began in June 2016. Garden Spring is a diamond in the rough. However, one has to look beyond the drudgery and dirt of chicken farming. It is a metaphor for the struggles in life and ultimately the just rewards of perseverance. An underutilized strip of land that is gradually quickened to life by the vision and desire to transform the community. Where some may see a mundane poultry farm we aim to inculcate the value of hard work and heart by allowing visitors to be stewards, if only for a while, of the divine gift of participation in this life; to get one’s hands muddy and tribute to beautifying and adding heart to the community. The Visitor’s experience in Garden Spring will involve many of the quotidian tasks involved in running a small chicken farm from cleaning to composting to some minor landscaping. All of which involves some elbow grease and sweat. The hope is that the Visitor will leave with a heart to serve and an understanding of our ethos of peace in the community. It has been almost one and a half year since the inception of The Blue Ribbon in Singapore. Its peace initiatives have reached a number of high learning institutions, and impacted both local and international youth that are living or residing in this little red dot island. Last week, in conjunction with United Nation International Day of Peace which happens annually on 21st September, TBR had a wonderful two hour conversation with seven staff and students from National University of Singapore , University Scholars Program (USP) on social enterprise and TBR commitment in building peace locally and globally. The meeting was arranged by Professor Kang Hway Chuan from Department of Chemistry and USP and coordinated by Ms Ang Lee Koon, USP students’ life manager. During this session, the students and Ms Lee Koon, and TBR had a deep 30 minute Skype conversation with Mansur, a young peace Afghan volunteer, and Dr Hakim Young or Wee Teck Young, a humanitarian doctor and social entrepreneur. The Skype conversation left USP students with challenging and provoking questions. Dr Hakim is a Singaporean who is now residing in Kabul, Afghanistan. He mentors young Afghan Peace volunteers in advocating peace and abolishment of war and was a 2012 recipient of the International Pfeffer Peace Prize. 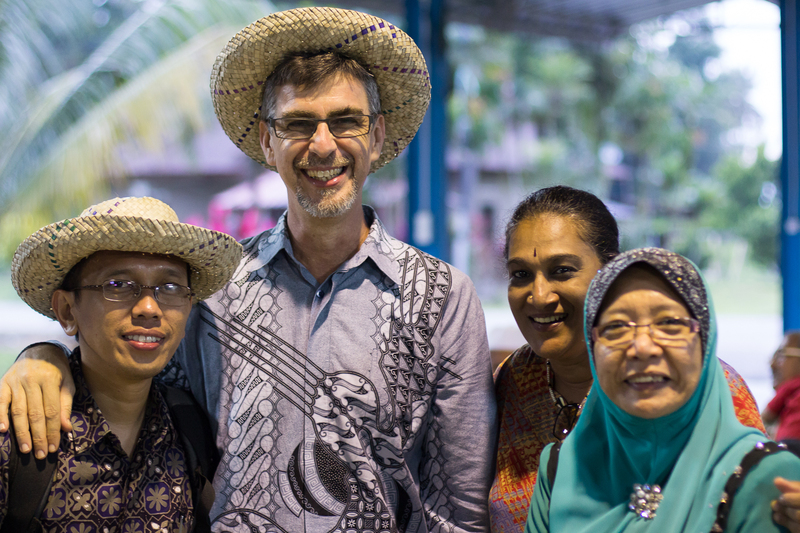 Norani Abu Bakar, the founder of The Blue Ribbon first met Dr Hakim during The Amber Initiative in June 2014. 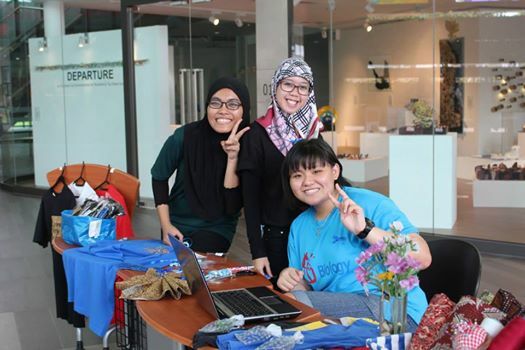 This Singaporean youth led NPO, founded by Meixi Ng andm Suraj Upadhiah, ordered 200 blue batik ribbon to wrap around the blue scarves made by Afghan mothers. Each youth had his or her name embroidered on a ribbon. This was a wonderful sewing project by Afghanistan and Singapore home bound mothers that are connected through the borderless human family. TBR has been looking into different ways to collaborate with Blue Scarves / Afghans Youth Peace Volunteers. The initial attempt was to connect both social enterprises’ beneficiaries. Today, both organizations connect their mentees regularly via Skype so that they can learn from each other on being global citizens who embrace equal responsibilities for world peace. Ms Ang and the president of University Scholars Club, Lim Cheng Lai, are now discussing on how to help selling products made by TBR beneficiaries. TBR hopes that something meaningful and long lasting will surface from this engagement. TBR hopes that NUS USP students will be opened to participate in various TBR related events that will be hosted by Department of Malays Studies of NUS in 2016. Four key events will be Peace Ambassadors Workshop and Young Interfaith Peacemaker Community (YIPC)Workshop for Asian youth, World Interfaith Harmony Week (WIHW), and Pathways Singapore Institute. WIHW was inaugurated this February 2015 at NUS. 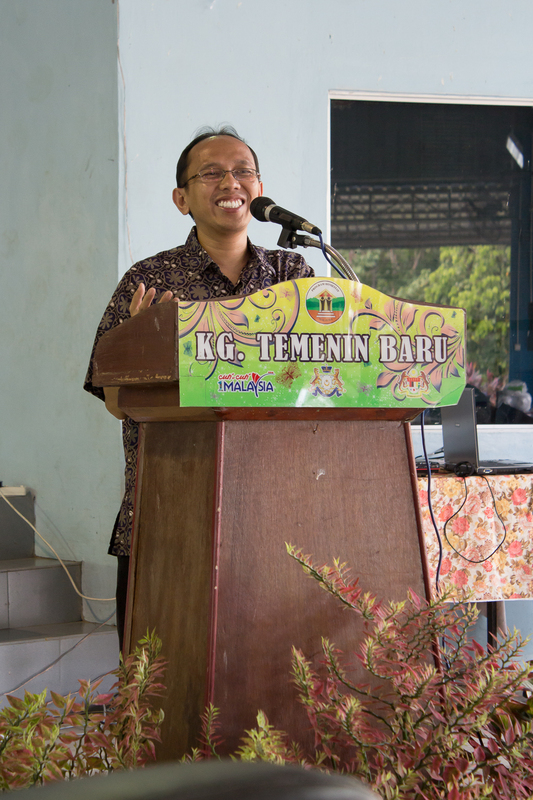 It was made possible due to the dedication and leadership of YIPC Indonesia co-founder, Jonathan Andreas and the support of Professor Noor Aisha Abdul Rahman, the director of Department of Malay Studies. TBR played its role in this ground breaking event by connecting Mr Andreas with key local interfaith leaders. 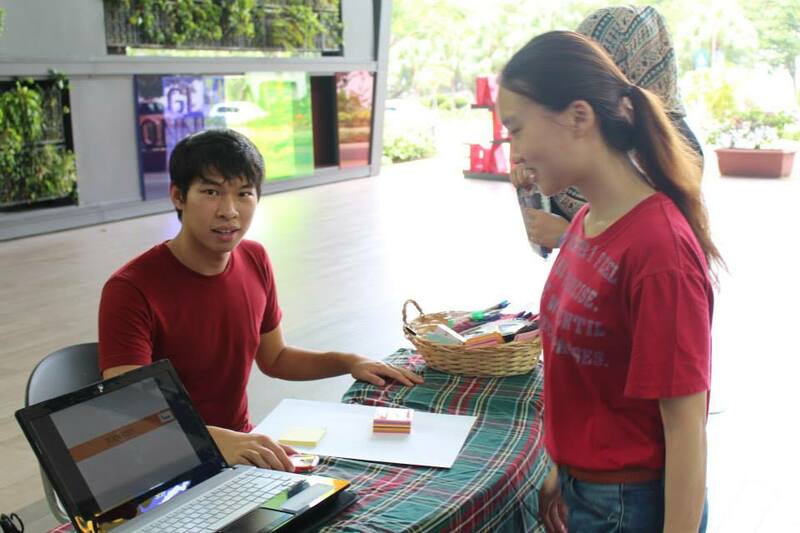 Besides NUS USP students, at least another 100 students from Temasek Polytechnic were involved with The Blue Ribbon project in the last one year period. They were connected with TBR through TP Enactus, Sustainable Community Development and World Issues subjects, and TP International Students Group’s 1st year students bonding weekend. The avenue created and the support given by TBR to these students provides experiential learning opportunities in understanding and serving those with needs in Singapore. 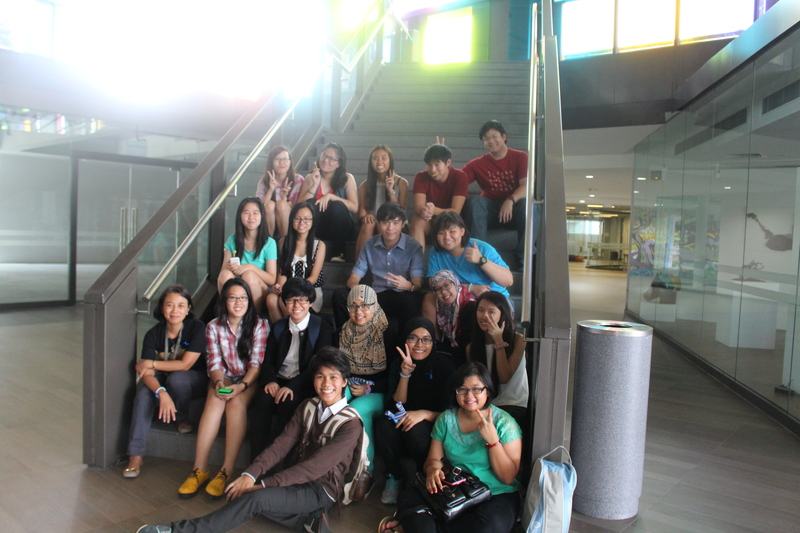 For TP international students, TBR event at Aliwal Arts Centre connected them with Singaporeans, and this was a critical phase for their social integration with the local community. 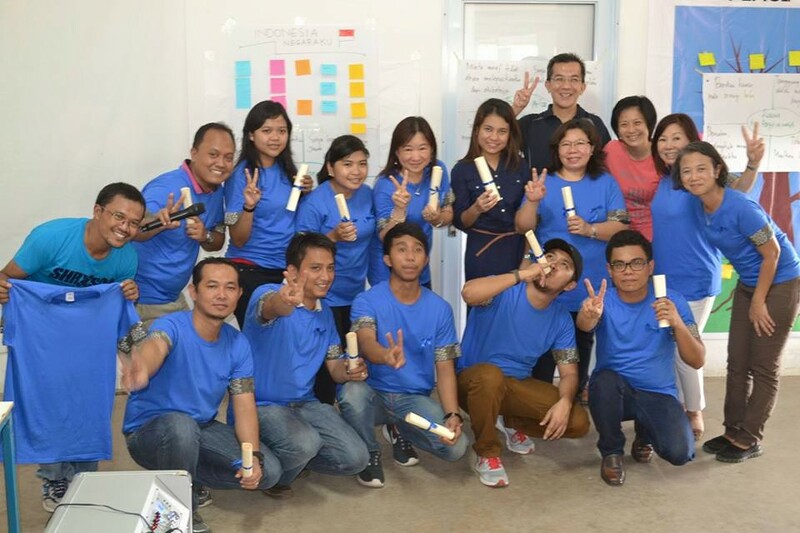 Thirteen Peace Ambassadors successfully conducted the 4th peace training at Bintan Bersatu Apparel factory in Batam this early September 2015. The participants were the first batch of BBA operators. The factory is owned by Bodynits Group, a Singapore company, and has around 1300 staff. 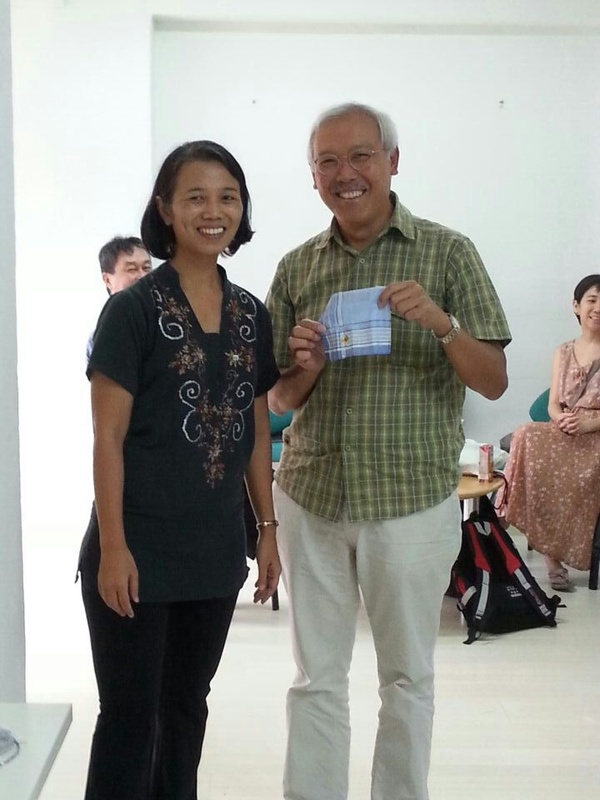 One of its directors, Ms Lynn Tan was instrumental in initiating this peace training at BBA. Her hope is not only to create a community of peace in the factory, but also to facilitate continuous learning of the local staff and grooming their leadership. 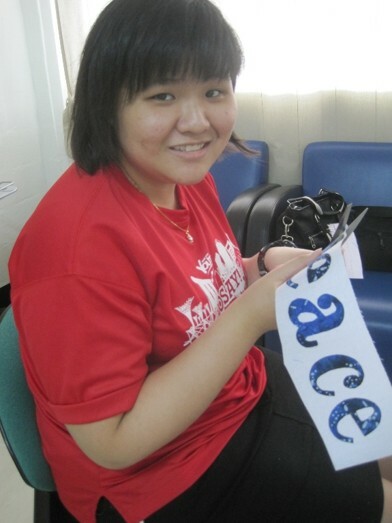 She also envisions in bringing this peace training to other Bodynits’ companies in China and Vietnam. 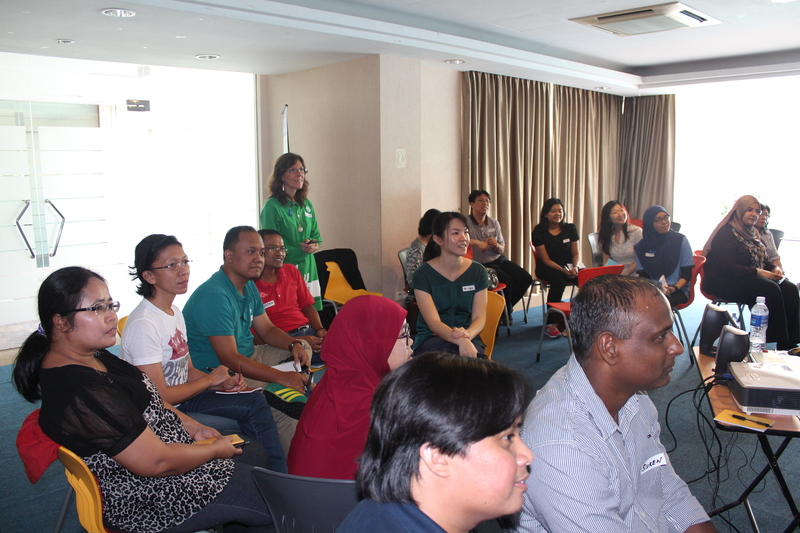 Local Batam leaders who participated in a few of the training too have expressed interest in bringing the Peace Ambassadors Workshop to other companies in Batam. Since the 1st peace training that took place in February 2015, all managers and line leaders have attended this 2 day 1 night workshop. 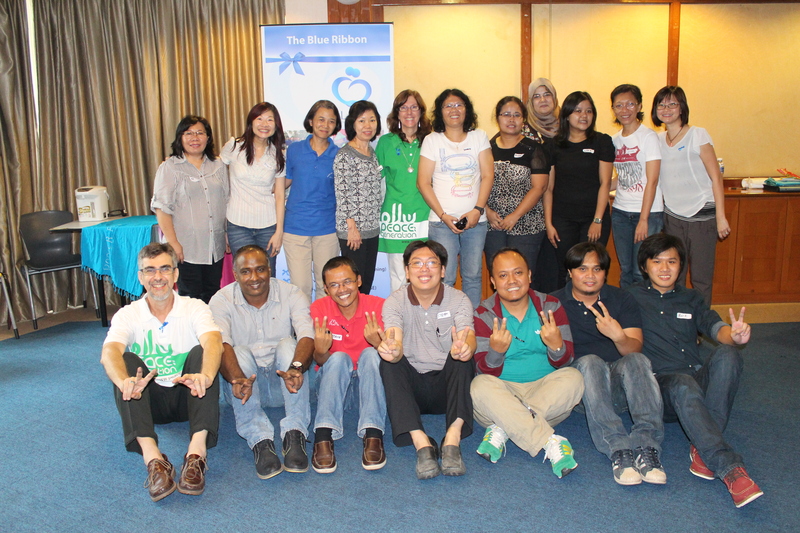 The Blue Ribbon founder, Norani Abu Bakar with the support of two Senior Trainers from Peace Generation Indonesia Raki Ali and Lian Fooks, have trained 20 staff to become BBA in-house Peace Ambassadors’ trainers. 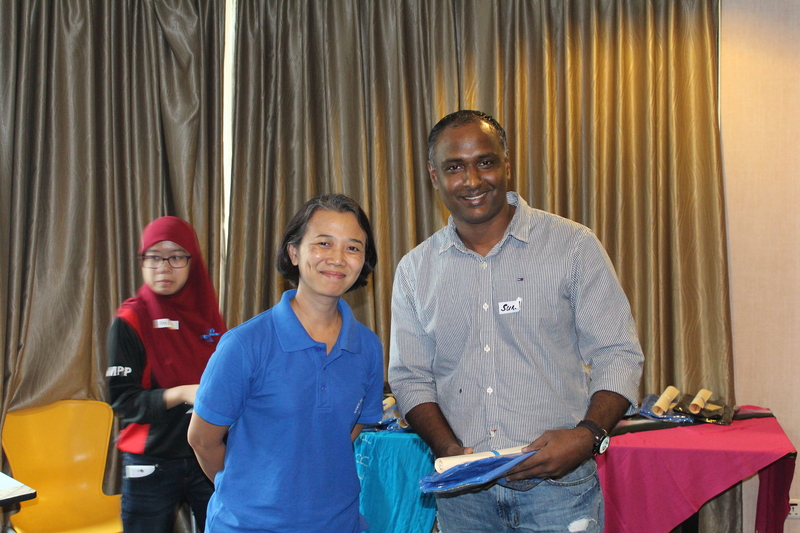 Its lead in-house trainer, Endieth Jaloe Prasiteyo was key in organizing and taking the lead in BBA in-house Peace Ambassadors training. All trainers participated on voluntary basis. In the last 8 months, they had trained another 130 co-workers. The company hopes that 1300 staff will step forward to voluntarily participate in this peace workshop and community services. The event has been very well-received by many staff that many had to wait for their turn to attend. The maximum number of participants for each workshop is 30 people. The two day workshop was full with engaging activities, discussion and reflection. At night, the staff enjoyed BBQ session and watched movie together. They began the 2nd day with fun aerobic at 6:00 a.m. led by BBA staff, Ms Lia. 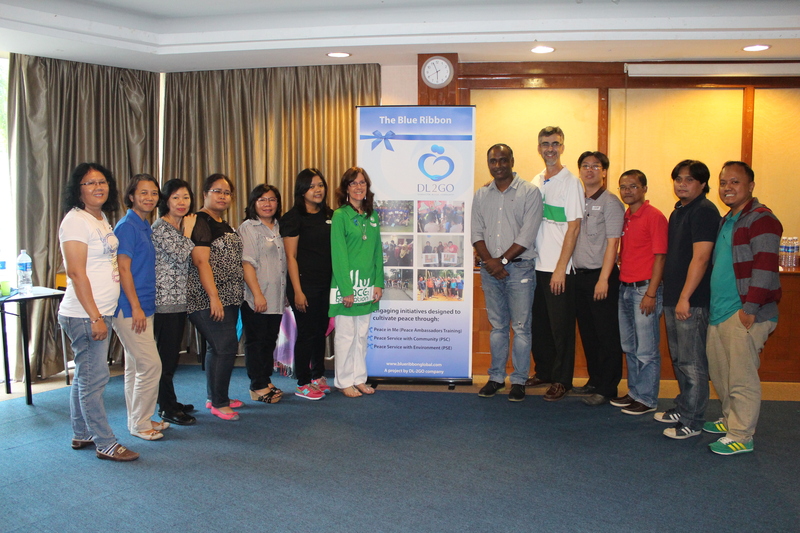 BBA co-trainers, Jennifer Del Mundo from the Philippines and Indah Irianty Situmorang had also supported The Blue Ribbon training in Singapore in June this year. Another two co-trainers, Joni Alfian and Lina Putri received scholarships from The Blue Ribbon and support from Bodynits to attend Young Interfaith Peacemakers Community National conference in Jogjakarta, Indonesia this August 2015. This was their first exposure attending a peace camp outside BBA. There, they met likeminded young leaders, mainly university students, from all over Indonesia who are championing spreading of peace in their local communities and neighbouring countries. The Blue Ribbon looks forward for continuous and mutual support with Bodynits Group International in cultivating peaceful characters and externalizing good values by caring for those with needs and the environment in the countries where their businesses are present. BBA Bisa! Peace Ambassadors Yes! 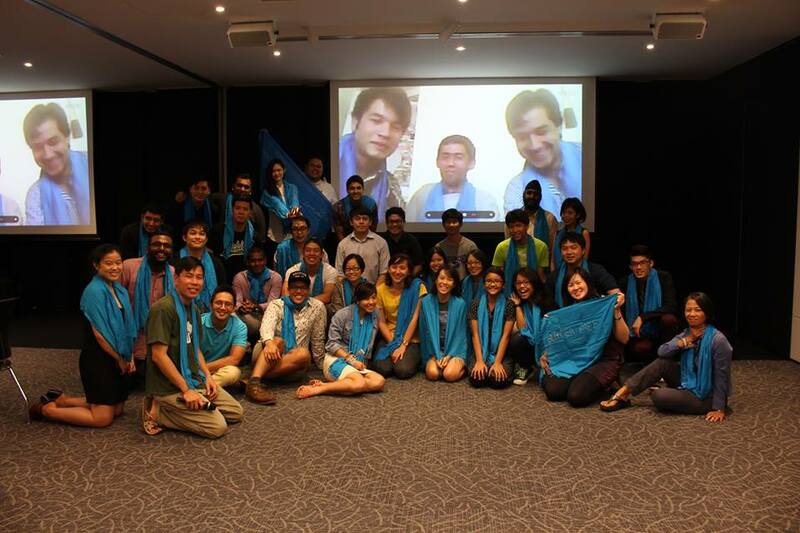 At last, the first Blue Ribbon peace training was launched in Singapore. This was a one day introductory workshop on peace as character value. The content of this workshop was jointly developed by Peace Generation and The Blue Ribbon. 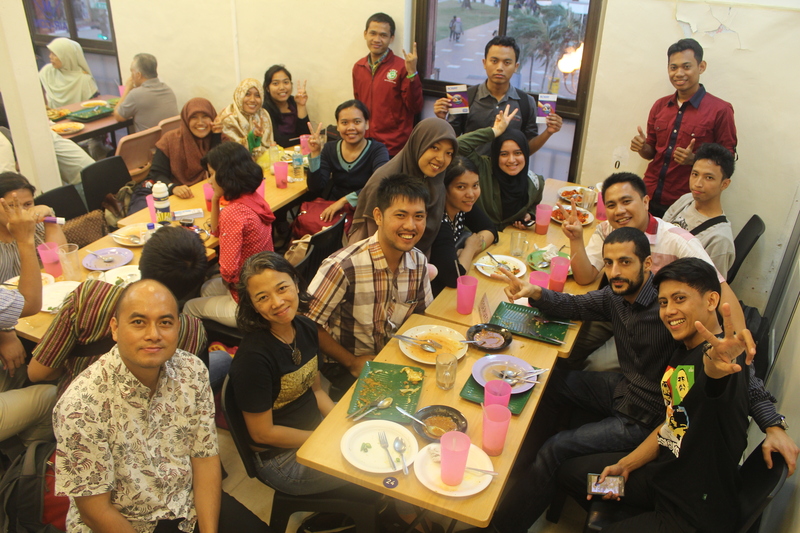 Twenty participants came and half of them were from Bodynits International branch in Batam, Indonesia. The group was very diverse. The farthest participant was from Cairo, Egypt. Others were from Brunei, Sri Lanka, the Philippines, Singapore and Indonesia. 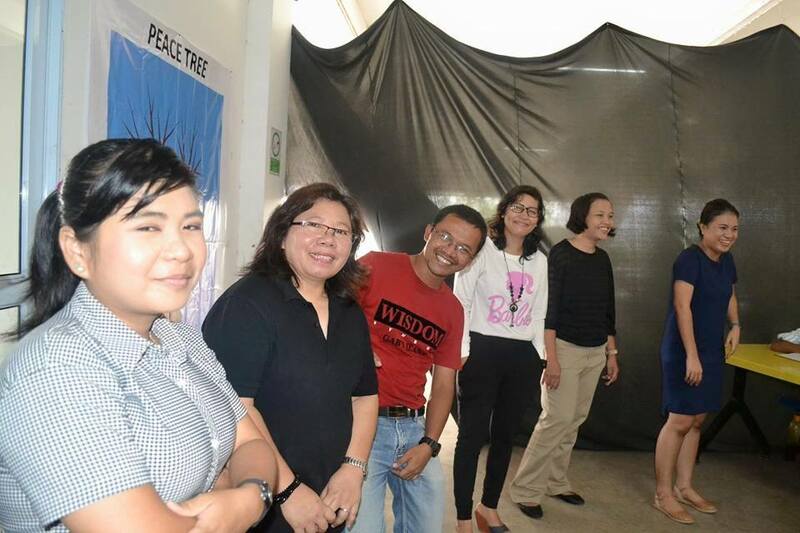 This Peace Ambassador’s training was led by Ms Norani Abu Bakar of The Blue Ribbon, and was supported by two senior trainers of Peace Generation, Raqhi Fooks and Lian Fooks. Both are from Australia. Some of the participants from Batam and Egypt are now planning in running this training in Batam , Indonesia and Cairo, Egypt in 2015. 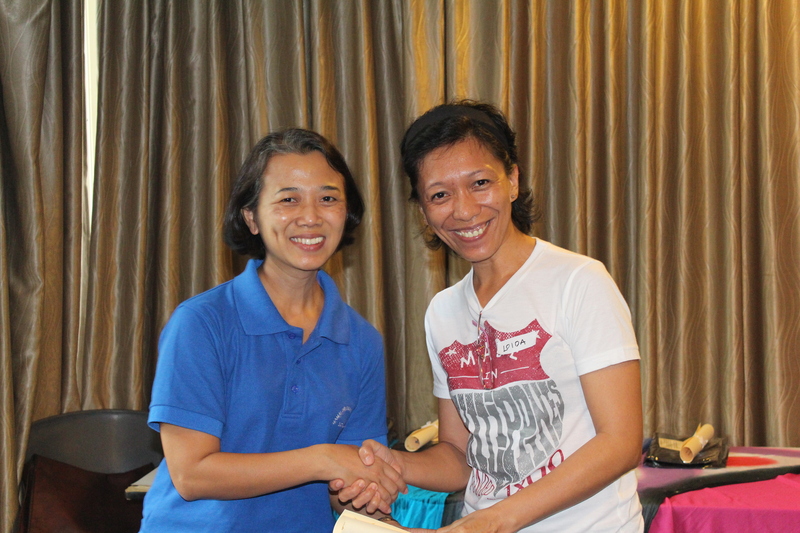 The training was also co-sponsored by Ms Christy Lim, Director of Places – a coaching and wellness company. Two members from TP Enactus/ The Blue Ribbon team Nurshahidah Azmi and Norasnah Bujang, graciously volunteered to make this event a successful one. 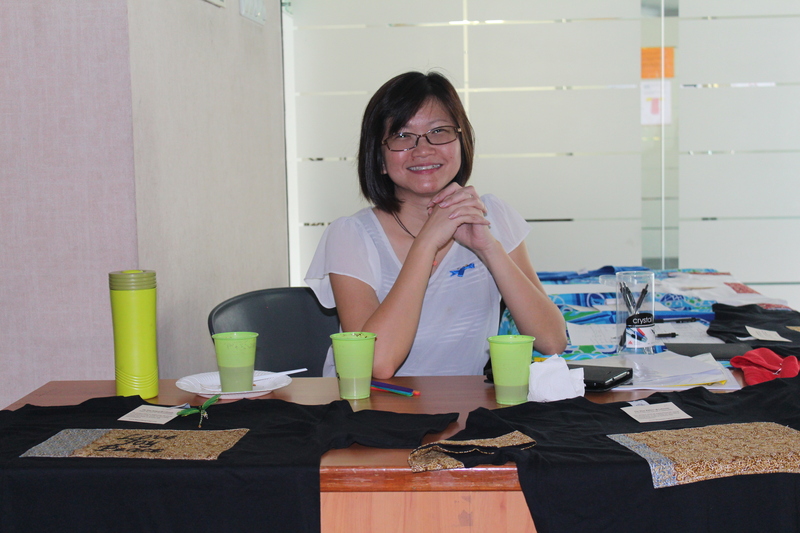 Most participants also kindly supported the Blue Ribbon @ Lakeside project by purchasing tee shirts made by lady sewers, who are in need of flexible working hour job. 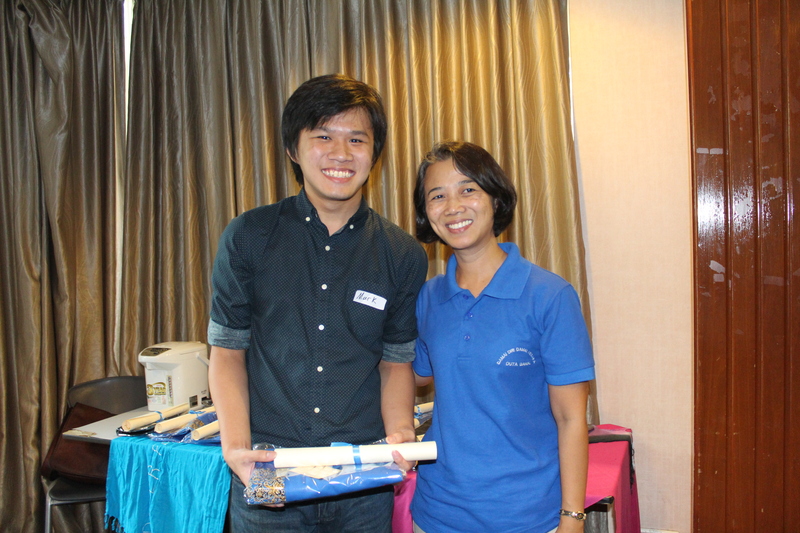 The Blue Ribbon also provided scholarships and sponsorship to some participants. Our thanks also goes to other supporters and volunteers whose names are not mentioned here. 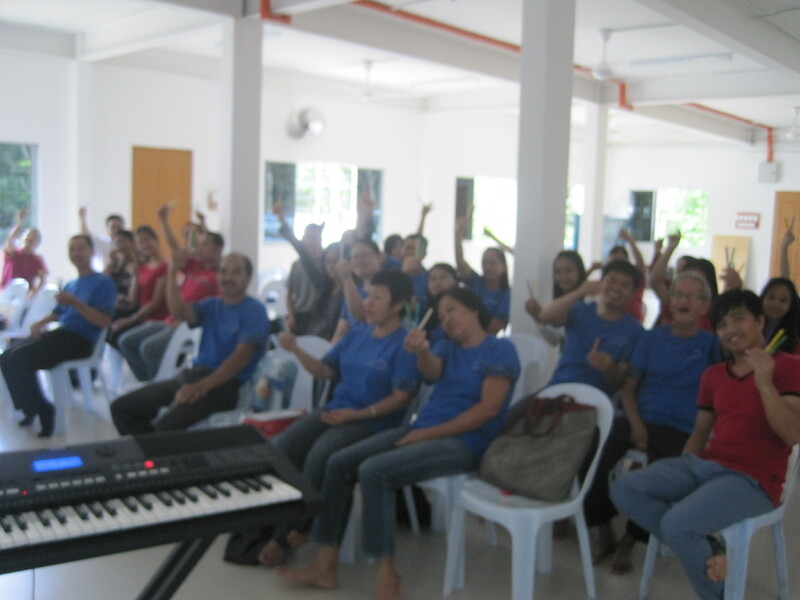 A bit more than 30 participants attended the first Blue Ribbon peace training in Sabah. 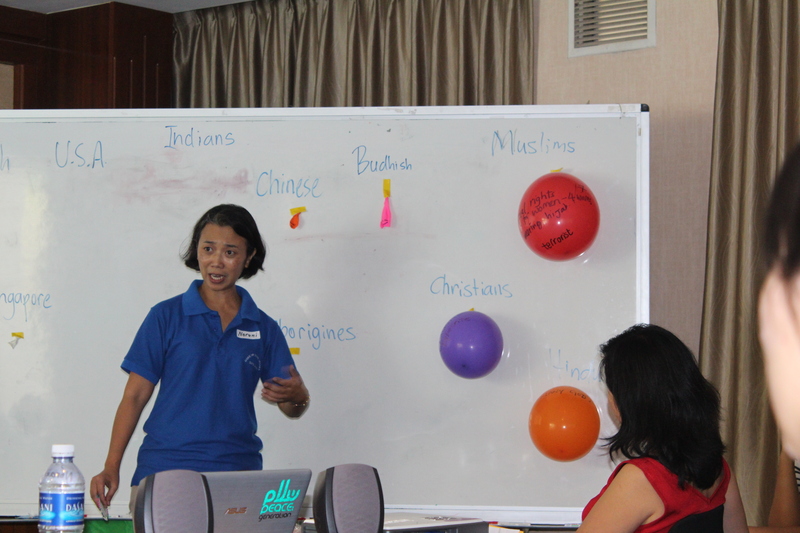 This was an introductory training on peace values, and it was conducted in Malaysian national language. 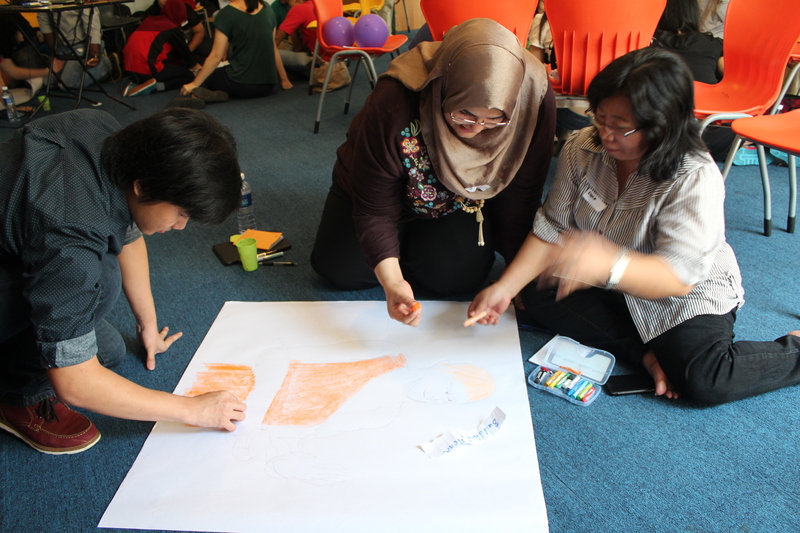 A few observers from Hong Kong and Kuala Lumpur also participated in some of the activities. Some drove for six hours to come to this full day Peace Ambassador training. A couple from Brunei who came to this training was very inspired to collaborate with The Blue Ribbon to run similar training in their countries. 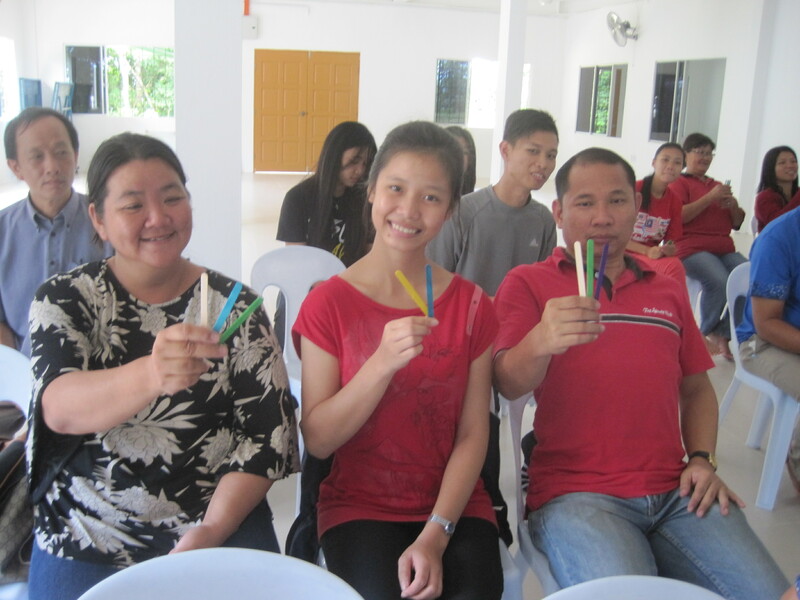 A teacher at a polytechnic in Kota Kinabalu, Ms Kristy Won, is now planning with the Blue Ribbon in conducting Peace Ambassador’s training at her school early next year. Participants from Sabah also supported this peace initiative by purchasing patched batik tee shirts sewn by Mothers Support Group at Blue Ribbon vocational sewing workshop Lakeside, Singapore. 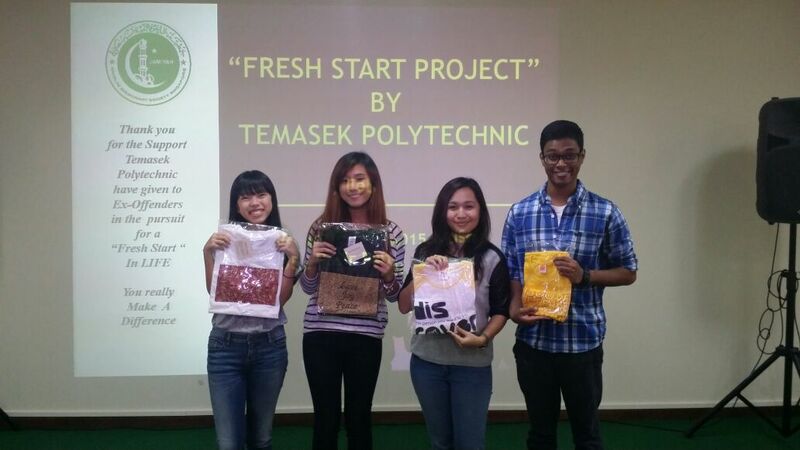 Enthusiastic young students from Temasek Polytechnic (TP) Enactus recently formed a group to support marketing of The Blue Ribbon @ Lakeside products and work. The team was led by Brandon Ho, who was an alum of TP. 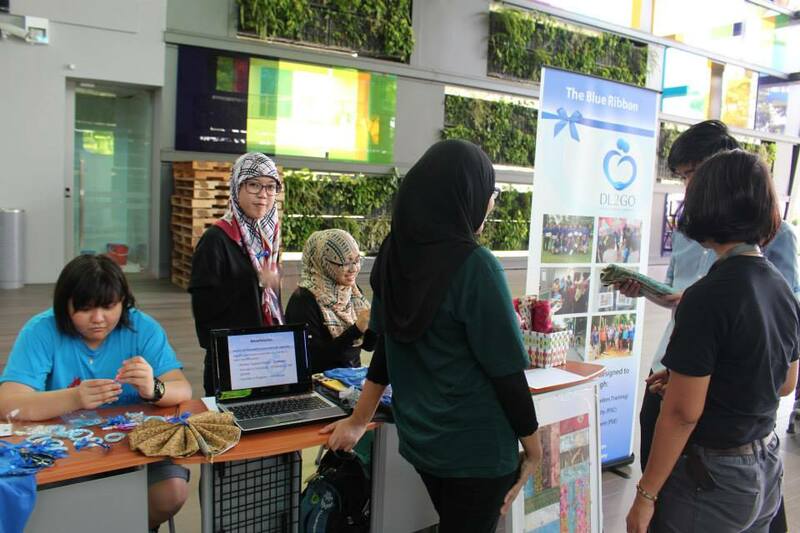 Recently, the group participated in Enactus Project Fair at TP. 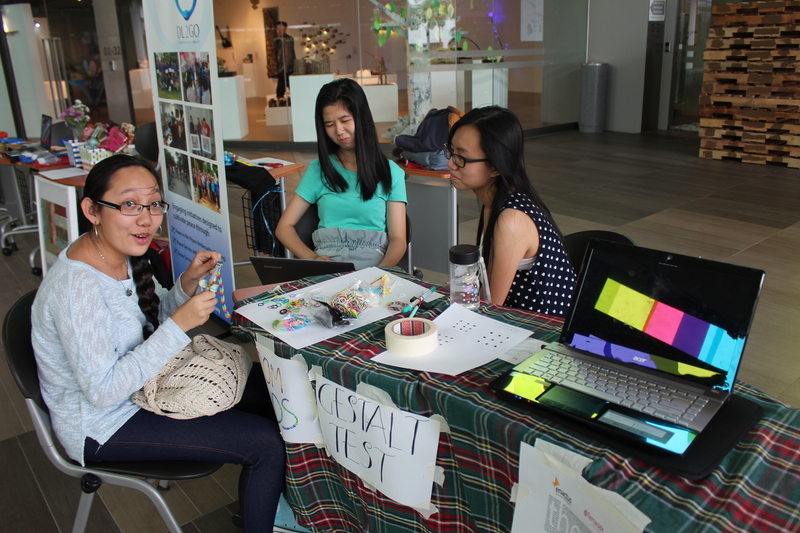 The members promoted their product design, ‘Peace Loom Band’ to students who came to their booth. In September, two of TP Enactus members, Nurshahidah Azmi and Norasnah Bujang from Brunei, presented their group marketing work to a panellist of businessmen during Enactus Singapore National Feedback session. For the last three weeks, the Blue Ribbon volunteers have been working very hard commissioning a sewing workshop for the first Blue Ribbon project in Singapore. This project is hosted by Lakeside Family Services to support social development of the needy ones that are cared by this organization. Supply to small business order as part of clients’ hands-on learning experience. Blue Ribbon also hopes that this ‘Peace Service for the Community’ (PSC) initiative will be a platform for volunteers and supporters from any background to serve together for the betterment of the local community. The fruit of this 3-week labour was celebrated last Wednesday when all sewing machines were ready to be used by members of Mothers’ Support Group. A number of tee shirts design for Peace Ambassador’s training were also almost completed, thus production can begin next week. Blue Ribbon hopes that the small job order for the workshop can provide some income for mothers who are not able to work full time elsewhere. 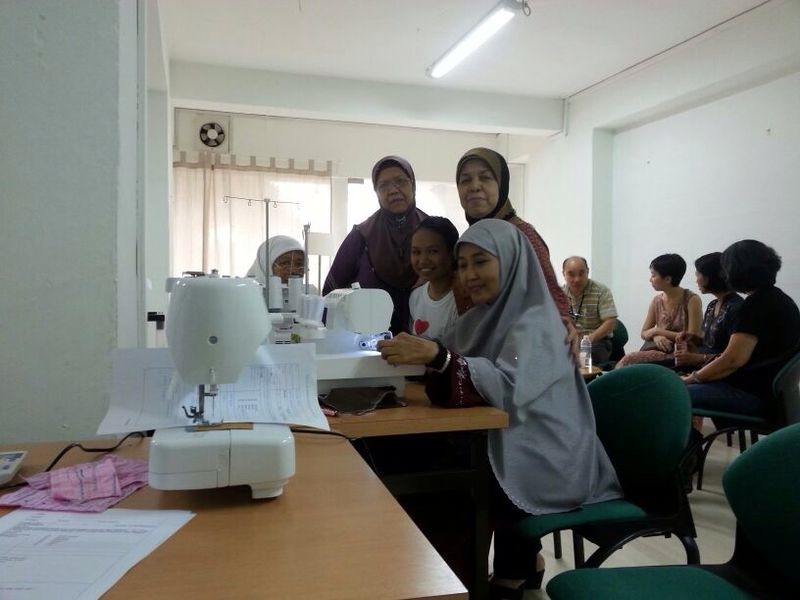 Thanks to Madam Farida Tahir and Madam Aminah Ahmad who diligently learned to use these machines from Singer in-house trainer and later transferred their sewing skills to others. 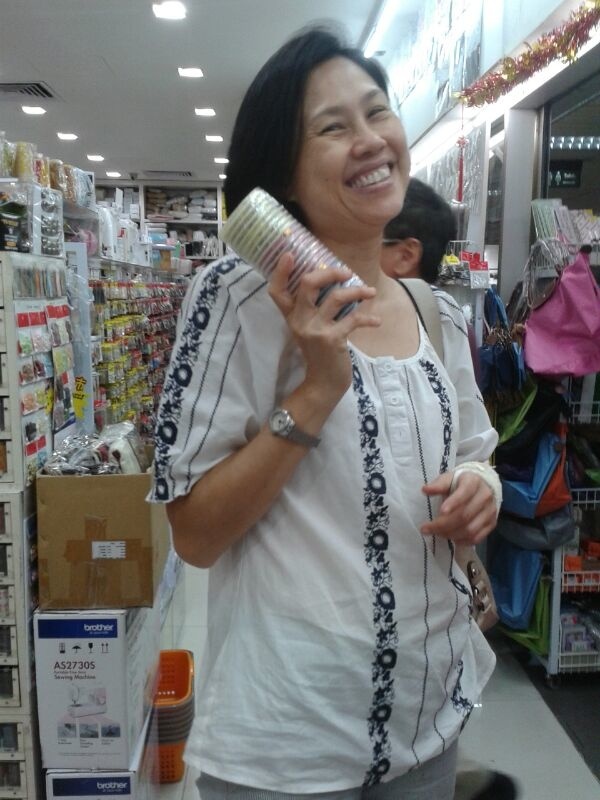 Special thanks also goes to Ms Grace Ling and Madam Racheal Seah who worked very hard with sourcing and buying items for the workshop, and Ms Vivien Cheng and Ms Rabiatul Ismail for their translation and administrative work. Last but not least, thank you to Ms Meixi Ng of Amber Initiative for preparing surveys and providing computer training to Blue Ribbon’s clients last Wednesday. 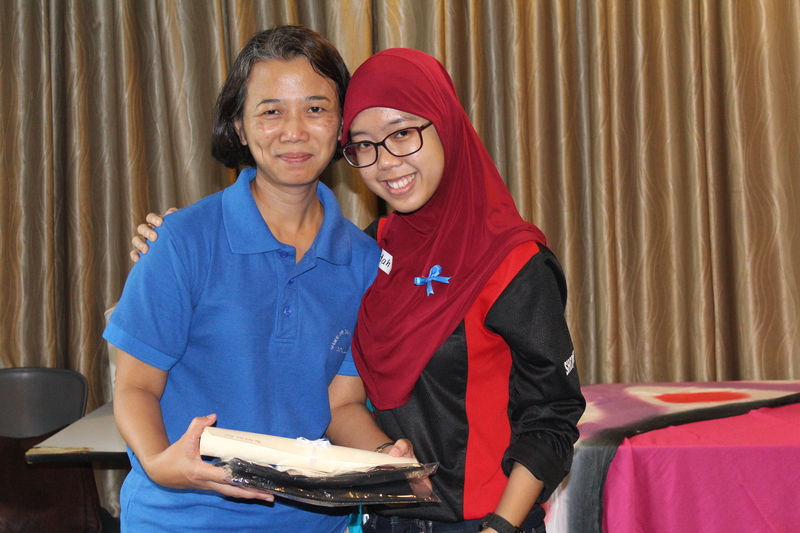 This first Blue Ribbon sewing training session ended with Ms Norani Abu Bakar (the Blue Ribbon founder) giving away gifts donated by Madam Alison Ng, and thanking all volunteers, Mr Jason Foo and Mr Hong Hai Seeto (key supporters to this project) and bidding farewell to Mr Matthew Ting. Matthew kindly flew from Sibu Sarawak, Malaysia to Singapore and spent almost ten days to help set-up the sewing room. Another volunteer, Ms Jessie Wang, from He Long Jiang, China is also here to train Blue Ribbon clients making ‘Dragonfly’ (fridge magnet). This product is a signature design of Home Sweet Home, a social enterprise that serves the unsheltered and physically challenged people in Shanghai. The raw materials for making these Dragonflies were generously donated by an ex-client of Home Sweet Home who is now the factory manager of this organization. Blue Ribbon hopes that other clients of Lakeside Family Services, such as the stakeholders of Family in Transition (FiT), will be inspired by his life transformation. The company will coorporate with Lakeside in providing training and helping FiT clients produce Dragonfly products during their stay at the transition homes. To other supporters, whose names are not mentioned here, the Blue Ribbon would also like to give thanks to your generous donation and kind support, and to continue welcoming you to serve the community through this project. 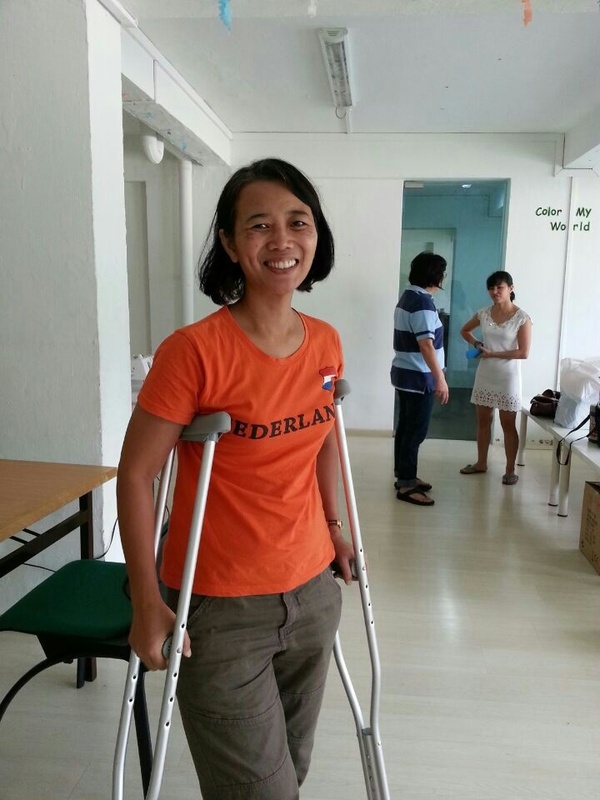 We also wish Norani, who continues to serve in-spite of her medical condition after her surgery, a speedy recovery. While Malaysians celebrated Malaysia’s 50 years anniversary, The Blue Ribbon launched its first nation building initiative at the foot of Panti Mountain in Johor, Malaysia. 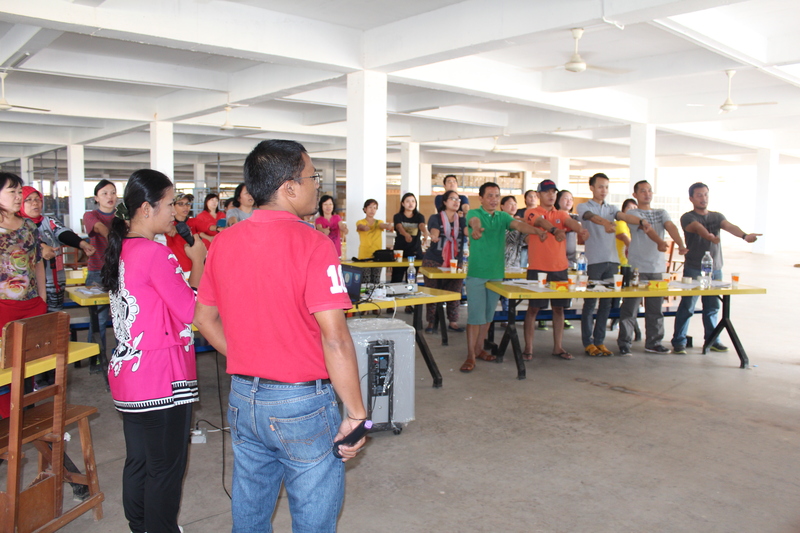 Twenty one participants who completed the 3-Day Training of Trainers took the oath as Peace Ambassadors or Duta Damai. 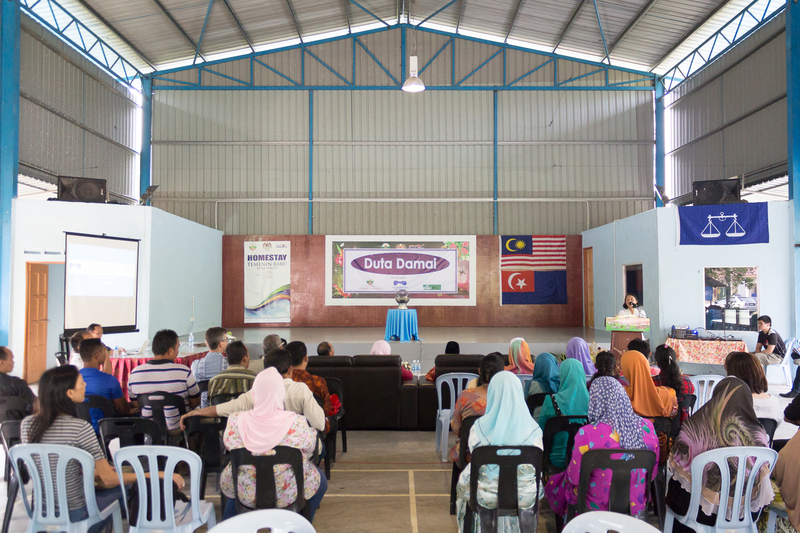 The inaugaration was witnessed by Duta Damai trainers, a few local leaders from Kota Tinggi and participants’ host parents. The objective of Peace Ambassador’s training is to instill peaceful values in building a diversified community that is harmonious, loving, and respectful towards one another. The training that was developed by DL-2GO company was supported by Peace Generation Indonesia, Kampung Temenin Baru Homestay and Community College Kota Tinggi. 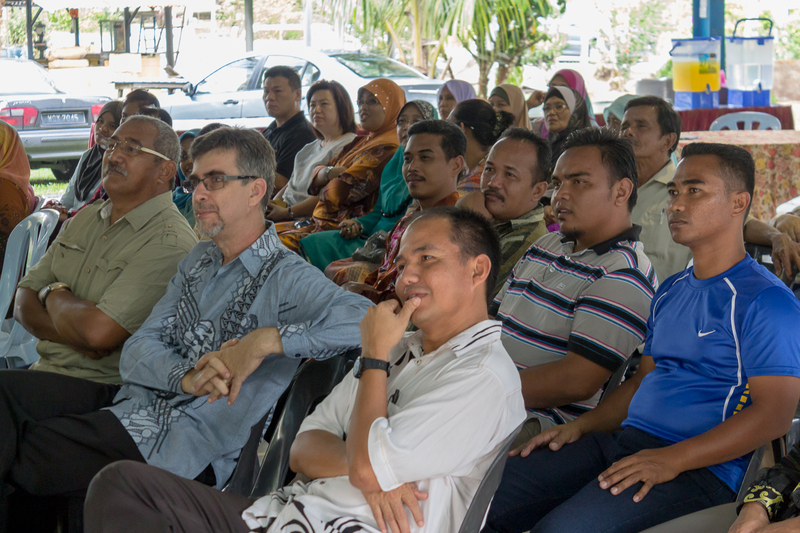 This was the first training launched by the Blue Ribbon initiative, and this initiative envisioned that a few thousand young leaders from Malaysia will participate in this training and be engaged as peace advocators in the next couple of years. 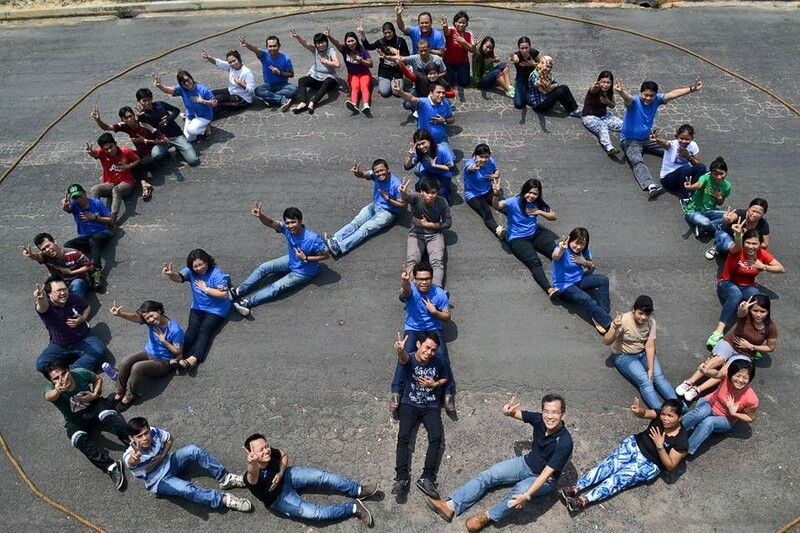 Peace Ambassadors – Cohort 50 were aspired to spread these peace values to the whole nation, following the footstep of DL-2GO’s partner, Peace Generation Indonesia, which had trained about two thousand trainers and twenty five thousand youngsters. The Blue Ribbon visited Kabul Afghanistan to deliver its Peace Ambassadors Workshop to a group of youth at the Ministry of Higher Education Afghanistan. In addition to this, the team also made a visit to the Afghan Peace Volunteers and donated winter clothing in preparation for the season in mid-January. October 2018, Kabul, Afghanistan – The Blue Ribbon Peace Ambassadors Workshop scheduled for October 2018 in Kabul nearly did not happen. It was supposed to be held in Kabul University, however the elections in Afghanistan were right around the corner, and due to safety concerns, the venue was changed from Kabul University to the office of the Ministry of Higher Education (MOHE). Only then, was the Peace Ambassadors Workshop able to proceed. 20 participants -mostly youths – attended the workshop to learn about peacebuilding and eventually contribute towards the cause in Afghanistan. 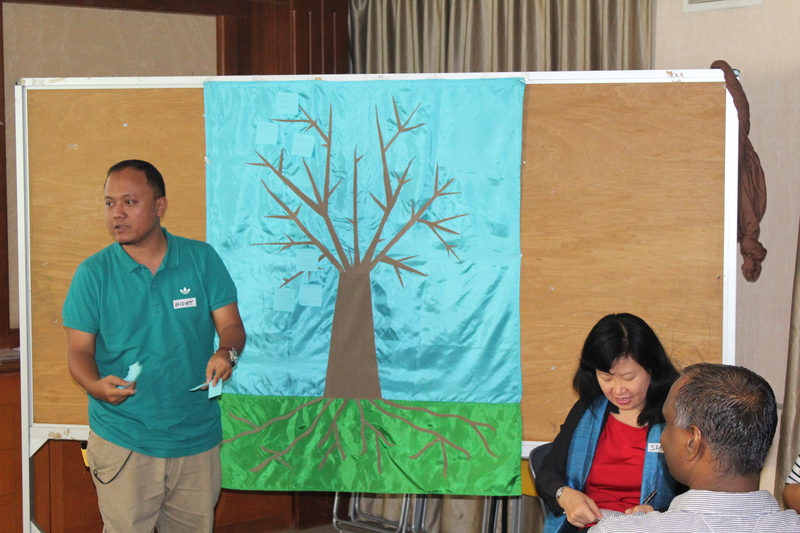 The opening session on Introduction to Peace and Diversity Education was facilitated by The Blue Ribbon Team, together with Mr. Paul and Ms. Khen whom the latter had attended previous iterations of this workshop in Indonesia. The Blue Ribbon Team also visited the Afghan Peace Volunteers (APV), a group of enthusiasts passionate about peacebuilding in Afghanistan. The inter-ethnic group of young Afghans, dedicated to building non-violent alternatives to war, is mentored by Dr. Hakim Young, a medical doctor from Singapore who does humanitarian and social enterprise work in Afghanistan. The Blue Ribbon handed over donations to APV. Fundraised by The Blue Ribbon and friends of Blue Ribbon, the donations included winter coats, shoes, neck scarves and gloves for 117 students of the Borderfree Street Kids School in Kabul’s mid-winterin January 2019. The group that was being mentored by Dr Hakim Young also received a camera among the winter coats that were specially tailored by Mardomi Clothes Production Company, a worker cooperative set up by APV. Many people contributed to the success of this time in Afghanistan. The Blue Ribbon would like to extend huge thanks to Sultan, Ali and Aziza for assisting the project in Kabul, and also express appreciation to Paul and Khen for being lovely travel companions despite the challenges faced. Finally, special thanks to Dr. Hakim and TBR’s international friends for all the support on this trip. Significant gratitude is extended toward Eastgate Consulting Company and the MoHE of Afghanistan for co-organizing the peace training during this time of turmoil. 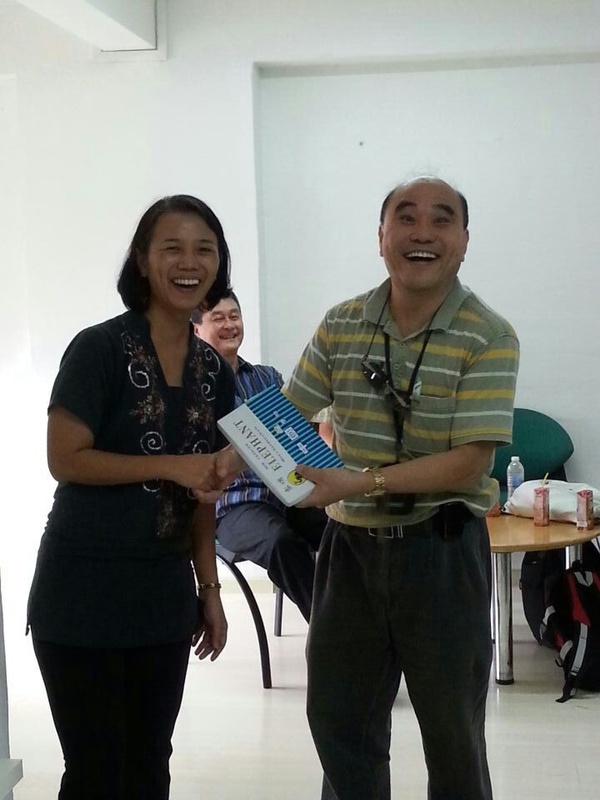 Co-edited by Ms. Sofina Tan & Mr. John Beh.